Good. 0800796276 Good Condition. Has scribbling. Has a small amount of writing/highlighting. Five star seller-Buy with confidence! Fine. Trade paperback (US). Glued binding. 208 p. Contains: Illustrations. Intended for a juvenile audience. In Stock. 100% Money Back Guarantee. Brand New, Perfect Condition, allow 4-14 business days for standard shipping. To Alaska, Hawaii, U.S. protectorate, P.O. box, and APO/FPO addresses allow 4-28 business days for Standard shipping. No expedited shipping. All orders placed with expedited shipping will be cancelled. Over 3, 000, 000 happy customers. Very Good. 0800796276 signs of little wear on the cover. The Triumphant True Story of Corrie ten Boom. 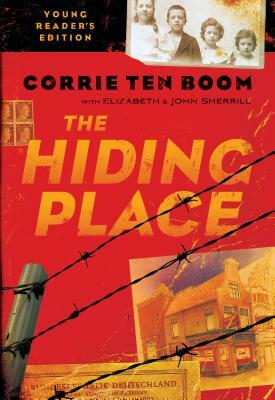 The biography of Corrie ten Boom's life during World War II is amazing. So much is packed into this profound book! From the very first chapter---no, the very first page!---I immediately connected with the story. It begins in the normal, happy days of Corrie's life, before the German invasion. I was actually surprised at how cheerful everything could be, and all the joy in the ten Boom household. This is the true story of her life. Who was Corrie ten Boom? She was the daughter of a watchmaker, and in fact, she was quite a skilled watchmaker herself. With her family being Dutch Christians, the Nazis did not come after the ten Booms---that is, not until later as Corrie and her family, gradually, secretly, became leaders in the Underground. They only did what was best for the forlorn Jews that entered into the ten Boom's house, even though it cost them everything. ...."It was a day for memories. A day for calling up the past. How could we have guessed as we sat there---two middle-aged spinsters and an old man---that in place of memories were about to be given adventures such as we have never dreamed of? Adventure and anguish, horror and heaven were just around the corner, and we did not know." ...."Oh Father! Betsie! If I had known would I have gone ahead? Could I have done the things I did?" Through everything the ten Boom family endured, they found some way to honor God and actually be thankful for the awful predicaments they were put in. To think that sleeping in damp, flea-infested beds could open an obscure opportunity! As I read chapter after chapter, it seemed that wherever Corrie and Betsie were, strange and wonderful surprises happened. There were so many blessings in the midst of fright and violence, that I simply lost count of them all. I know the reason why these gifts were showered on them; it was their steadfast faith. ...."The truth, sir, is that God's viewpoint is sometimes different than ours---so different that we could not even guess at it unless he had given us a Book which tells us such things." Corrie's story really astounded me. And just as much, or even more so, Betsie's part of the story left me shocked by her selfless thoughts---I wish I could read more from Betsie's point of view. Yes, there are gruesome parts in this book. Horrific deaths, torturing, fighting, and war. It's a lot to take in and think about. But you'll learn the meaning of The Hiding Place... and if Corrie ten Boom could find such a place in the midst of World War II... then so can we. The Hiding Place now ranks as one of my favorite books, and I will always treasure it. It's not for young readers, but makes a great read for high school students or adults. This is an amazing book with a wonderful testimony of this woman. She examplifies God's strategic plan to use us for His plan. An amazing book, that will inspire both young and old. A book that shows the courage and strength that can be found in family unity. This testimony shows you the love and the conviction that people had for the Jewish people in the Holocaust. At the beginning of the book we are shown the extraordinary life of a God fearing family. They are well known all over the country of Holland, not only for their good works in watch making but for the caring people they were. They show no partiality for the poor or rich, the weak or strong, Jew or Gentile. They love everyone and welcomed anyone into their little home. Casper Ten Boom was given the opportunity, when about to be taken to prison, to stay at home if only he would not let any Jews into the house. To this he replied, that he would let anyone who came, into his home. One of Corrie?s ministries before and during the war was that of teaching those who were mentally handicapped. The impact through reading the book that I felt was that of the forgiveness that Corrie found in her heart. To forgive those who had so inhumanly treated her family, but more so for those who were responsible for the death of her father and her sister. How true this is when we place our trust in Him!